Variants of the basic principles of modern-day plywood manufacturing have been used down through the ages since ancient Egyptian times. Plywood is used widely throughout the construction industry, and is available in different thicknesses for various purposes such as walls, floors, sheds and roofing. Valued for its strength and versatility, plywood withstands the test of time better than any other laminate wood product that is similar in design. Plywood, or the ancient equivalent in the form of laminated wood veneer sheets, was discovered by archaeologists in Egyptian pharaoh's tombs. In China a thousand years ago, its people shaved wood into chips and strips, gluing them together for use in furniture making. The English and French, during the 17th and 18th centuries, fashioned wood in much the same way as the Chinese to make furniture and other practical items. Czarist Russia is credited by historians to have used a similar method of wood working before the 20th century. In the early days of modern plywood production, a number of hardwoods were used for its manufacture, producing doors, chests and cabinetry. Softwoods made into construction plywood appeared later in the 20th century. Plywood comes in 4 ft. x 8 ft.
sheets in several popular thicknesses including 1/2-inch, 3/4-inch and 5/8-inch. The 1/2-inch plywood would be used for making chests and cabinets, while 5/8-inch plywood would be used for constructing a roof. And, 3/4-inch plywood is good for flooring because of its strength and durability. 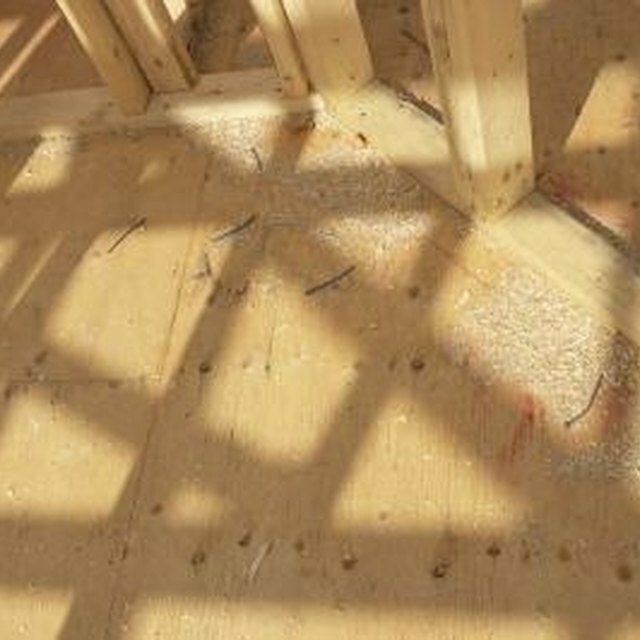 Plywood is better used for roofing than OSB (Oriented Strand Board) because OSB, once it gets wet, tends to turn to mush. Plywood may be reused by drying out the board and repairing the torn piece of roofing material or replacing missing shingles. OSB, although it makes good use of forest wood products, is better placed where it will stay dry, such as floors covered with plastic, terra cotta or ceramic tile. Water resistant grades of plywood (WBP Weather and Boil Proof) are available for exterior uses including sheds and cladding for buildings. Special glue is used within the layers of ply to resist water up to a certain point. Varnishing or painting the surface of the exterior grade protects the plywood from the harsh elements to which it is exposed. Marine Plywood is available for nautical applications as the ply has superior waterproofing qualities. Interior plywood is not as waterproof as exterior plywood, as moisture is not as much of a concern, inside. In 1964 Georgia-Pacific Corporation started producing plywood from softwoods in the first pine plywood mill of its kind in Fordyce, Arkansas. Two-thirds of the United States plywood production companies are based in the southern region serving the plywood needs of the nation and beyond.